This is more a generic style of tying than an individual pattern. 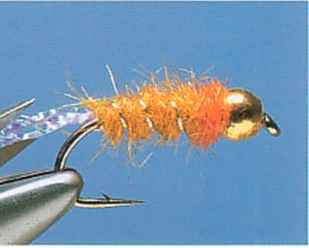 Goldhead Bugs can be tied in a variety of colors, although they all have a metal gold bead at the head to give weight and a fish-attracting sparkle. 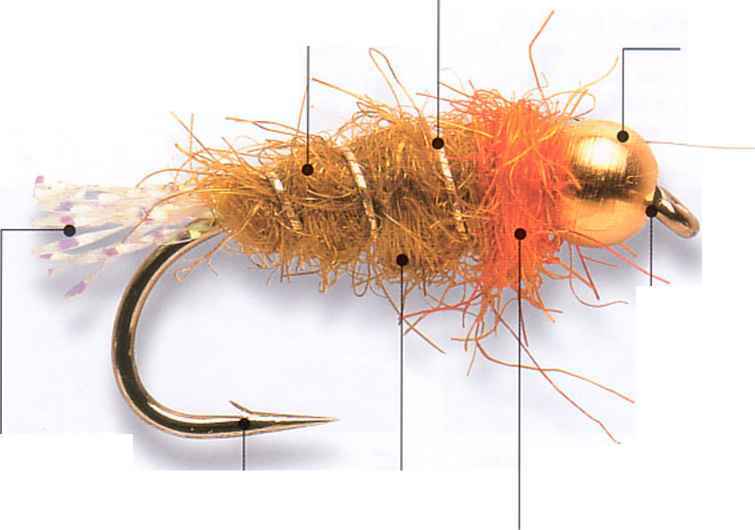 Being well weighted, Goldhead Bugs are designed to fish deep, and they work well both in lakes and rivers. When using a gold bead, it is important to find a hook that will accept it. The shape of some hooks prevents the bead slipping around the bend, so it is always worth checking first. For most patterns, an ordinary gold bead plus turns of lead wire provide enough weight, but it is now possible to buy tungsten beads, which are even heavier and sink faster. 1 Select a hook that will accommodate the gold bead. 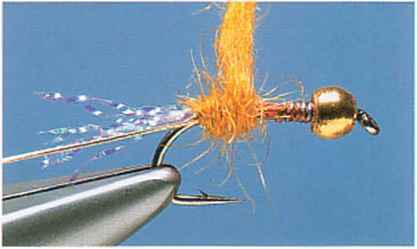 Before fixing the hook in the vise, slip the gold bead over the point and slide it to the eye. Secure the hook in the vise. 2 With the bead tight against the eye of the hook, wind on a few turns of lead wire, pushing them into the recess at the back of the bead. 3 Run on the tying thread, using it to fix the A Catch in 2 inches (5cm) of fine, oval, gold lead wire in place. Carry the thread down the " tinsel at the base of the tail and dub on a shank and catch in a few strands of pearl Crystal generous pinch of amber fur. Wind the dubbed fur Hair opposite the barb. up to the bead. The finished body should be quite chunky, mimicking the shape of a caddis pupa. 5 Wind on the oval, gold tinsel, making three evenly spaced turns. Secure with thread and remove the excess. 6 Dub on a pinch of orange fur and wind it on as a collar. Cast off the thread with a whip finish and trim the Crystal Hair tail to length. This ingenious pattern imitates a cased caddis larva as it crawls along the riverbed. As a caddis larva moves, its legs, plus the front part of its body, peep out of the front of the case. 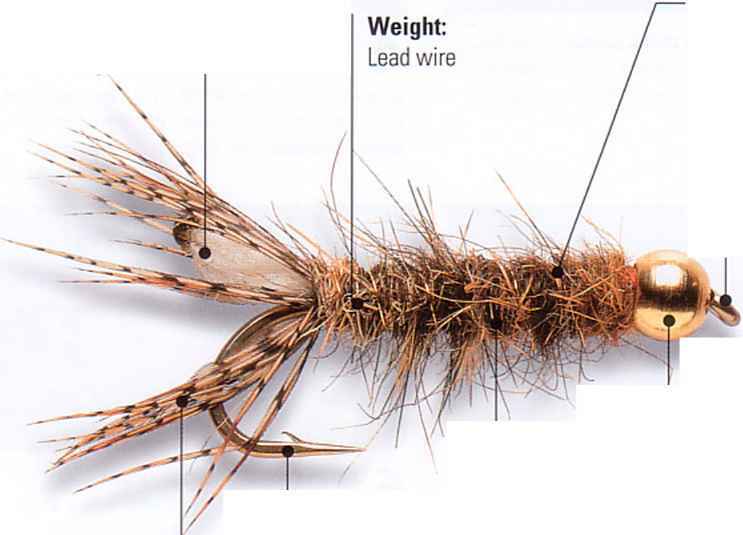 The Peeping Caddis uses a short section of yarn with brown partridge feather to imitate this, and by burning the tip of the yarn with a match flame it is possible to mimic the larva's dark head. 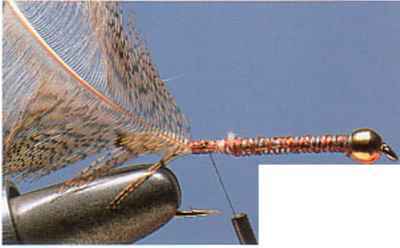 As the pattern is designed to fish right on the bottom, it is heavily weighted with turns of lead wire, along with a metal bead at the eye. Dubbing on a large pinch of hare or squirrel fur forms the caddis's case. The proportion of the stiffer guard hairs used will alter how rough the effect is. 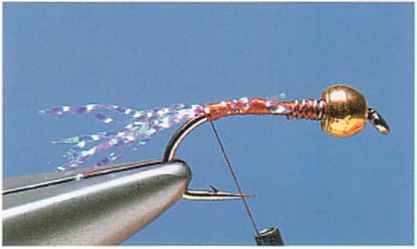 1 Select a hook that will accommodate the gold bead, and slip it over the point and up to the eye before fixing the hook in the vise. Wind on close turns of lead wire. Leave a small gap in the wire underbody, toward the bend of the hook. 2 Run on the tying thread at the eye and wind it over the lead wire. Catch in a short length of yarn, burned at one end, at the bend, in the gap left behind the lead body. 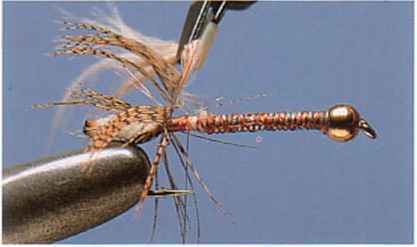 4 Hold the hackle by the base with hackle pliers and wind on three turns. Stroke the fibers back after each turn so that they project over the yarn. Secure the hackle and trim off the excess. 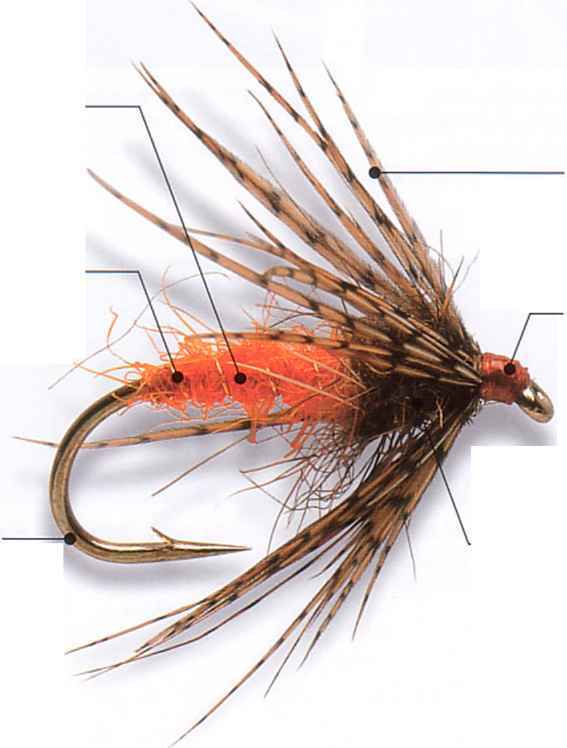 3 Prepare a brown partridge hackle, stroking the fibers away from the tip. Catch it in by its tip. at the base of the yarn body. 5 Catch in 3 inches (7.5cm) of fine, gold wire before applying a body of dubbed hare's fur. 6 Carry the hare's fur right up to the bead, then wind evenly spaced turns of the gold wire to form the rib. Secure the wire and remove the excess. Cast off the tying thread. How to tie a gold headed daddy? 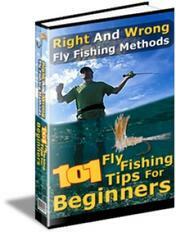 How to tying a goldhead daddy? How to tie a pearly daddy?